Georgia has agreed to pay twice as much for its gas from Russia, according to Russian energy giant Gazprom. An hour after Gazprom threatened to cut off supplies, the firm announced that Tbilisi had agreed to pay $235 per 1,000 cubic metres, up from $110. Georgia had until then refused to accept the demands, saying it was being punished for political reasons. Georgia's prime minister had earlier told a press conference that Azerbaijan would be its main gas supplier in 2007. He said Georgia would continue to buy gas from Russia, but did not refer to the terms of the deal or how it came about. The two countries have been at loggerheads since Georgia arrested four Russians in September, who they accused of spying. The Kremlin hit back with an air, sea and postal blockade on Georgia and a crackdown on Georgian migrants in Russia. A ban on key Georgian exports, such as wine and mineral water, has also been in place for months, with Russia citing health concerns. Gazprom has argued that Georgia must pay significantly more for its gas to bring rates into line with European prices. 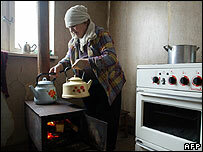 In a similar dispute earlier this year, Gazprom cut off gas supplies to Ukraine. The Ukrainian row, which caused a temporary disruption in gas supplies to western Europe, led to criticism that the state-controlled Russian firm was using gas exports as a political weapon. Gazprom, which is looking to expand its influence in the region and across Europe in general, is also embroiled in a price dispute with neighbouring Belarus. A senior Gazprom official said that Georgia would buy 1.1 billion cubic metres of gas from it next year. "Clouds have dispersed, the sky has cleared and we can look to the future with optimism," said Alexander Medvedev, head of the firm's export division. But Gazprom had earlier accused the Georgian government of snubbing it in talks aimed at finding a solution to the long-standing price dispute.